Recueil d'appareils à vapeur employés aux travaux de navigation et de chemins de fer. Although the work of the great 19th century bridge and railway engineers is appreciated, the crucial role played by the contractors in building what were often projects of a new magnitude at difficult or dangerous sites is generally overlooked. Castor was the leading civil engineering contractor in France during the first decades of railway building and developed specialised plant and techniques to answer the problems posed by such large-scale construction. He was primarily concerned with foundation work and one of his major contributions was to the improvement of the steam dredger, first introduced to Europe from England in the 1830s. By 1850 his dredgers could excavate more than 1500 cubic metres of spoil per day, a vast advance over the performance of previous machines. The characteristics and capabilites of four types, three floating and one on rails, are described here together with a breakdown of their cost and the consequent price per cubic metre of dredged material. This kind of clear exposition and awareness of efficiency and economy runs throughout the book as Castor goes on to describe steam-operated lifting apparatus, winding gear and pontoon pile drivers, all designed and used by him. He was also concerned with the building of railway embankments and the laying of track beds, supplying the railway companies with dredged material for fill or ballast and even designing a machine to assist in the laying of Vignoles rails on the Chemin de Fer du Nord, a task previously carried out by hand. The final part of the book is devoted to the Kehl Bridge over the Rhine at Strasbourg, which was a landmark in foundation engineering. It was built on compressed air caissons of an unprecedented size at an unprecedented depth and Castor as contractor contributed considerably to its success. 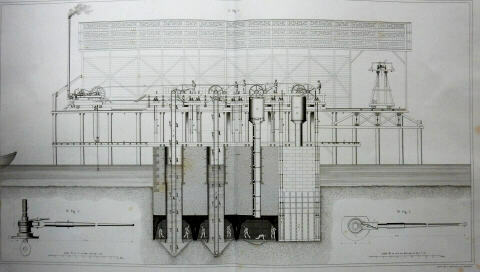 In a project of such magnitude he brought his long experience to bear in the conception of the access bridge, the elevated covered working platforms complete with gantries, the assembling, restraining and lowering of the huge caissons, the vertical chain bucket dredgers, the airlocks, and many subsidiary installations, all of which are described here. Books written by contractors about their work are unusual; this is a particularly splendid example with its generous format, clarity of thought and fine plates. It is also unusual in that it was produced in full morocco as here, but also in a cloth version. A second edition appeared in 1869. Folio. (iv) + 50pp, 19 double-page engraved plates. Publisher's full morocco. Some browning within but overall a lovely copy of a rare work. Presentation inscription from Castor to "Monsieur Baroche, President du Conseil d'Etat".